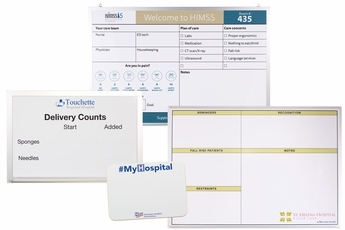 Opti-Print® custom printed dry erase boards for hospitals. 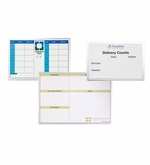 We can create any type of custom printed hospital dry erase boards to suit your needs. 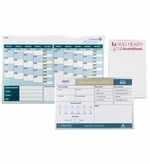 Need a set of patient room dry erase boards that not only look great but erase clean as well? Let us design and make them for you. We make all of our boards in our own manufacturing facility so we can offer great quality and quicker lead times! 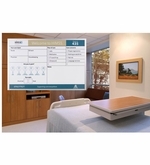 What sets our printed hospital boards apart from the competition? 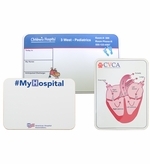 Using Opti-print™ custom printed hospital boards may help stop the spread of infection in your hospital. How? Well unlike other custom printed boards, the dry erase writing surface on our printed boards can be cleaned with Isopropyl alcohol. This procedure will not hurt our writing surface and independent test lab results show that our boards washed down with a 70% alcohol solution killed over 99.99% of Staphylococcus and E. coli bacteria. A copy of our lab test is available upon request. We are so confident in the dry erase writing surface of our custom printed boards that we offer a 5 Year Total Erase Warranty that our dry erase writing surface will erase cleanly every time with proper care and maintenance. Our boards are going to look clean, erase clean and be clean. Non-Magnetic writing surface. Boards up to 4 x 8. From "Sizes" "182: 18\" Tall x 24\" W (+$43.95)" "218: 24\" Tall x 18\" W (+$43.95)" "203: 24\" Tall x 36\" W (+$74.95)" "302: 36\" Tall x 24\" W (+$73.95)" "304: 32\" Tall x 45.5\" W (+$134.95)" "403: 45.5\" Tall x 32\" W (+$134.95)" "404: 48\" Tall x 48\" W (+$233.95)" "405: 48\" Tall x 60\" W (+$259.95)" "406: 48\" Tall x 72\" W (+$301.95)" "408: 48\" Tall x 96\" W (+$368.95)"
Custom printed dry erase boards that will accept magnets and other magnetic accessories. From "Sizes" "182: 18\" Tall x 24\" W (+$74.95)" "218: 24\" Tall x 18\" W (+$74.95)" "203: 24\" Tall x 36\" W (+$106.95)" "302: 36\" Tall x 24\" W (+$106.95)" "304: 32\" Tall x 45.5\" W (+$199.95)" "403: 45.5\" Tall x 32\" W (+$199.95)" "404: 48\" Tall x 48\" W (+$275.00)" "405: 48\" Tall x 60\" W (+$325.00)" "406: 48\" Tall x 72\" W (+$375.00)" "408: 48\" Tall x 96\" W (+$475.00)"
Small framed custom printed patient room boards with aluminum frames. From "Sizes" "1824: 18\" Tall x 24\" W (+$39.99)" "2418: 24\" Tall x 18\" W (+$39.99)" "203: 24\" Tall x 36\" W (+$66.95)" "302: 36\" Tall x 24\" W (+$66.95)" "" "1824-NT: 18\" Tall x 24\" W No Tray (+$39.99)" "2418: 24-NT\" Tall x 18\" W No Tray (+$39.99)" "203-NT: 24\" Tall x 36\" W No Tray (+$66.95)" "302-NT: 36\" Tall x 24\" W No Tray (+$66.95)"
Small unframed custom printed patient room boards that attach with double sided tape.